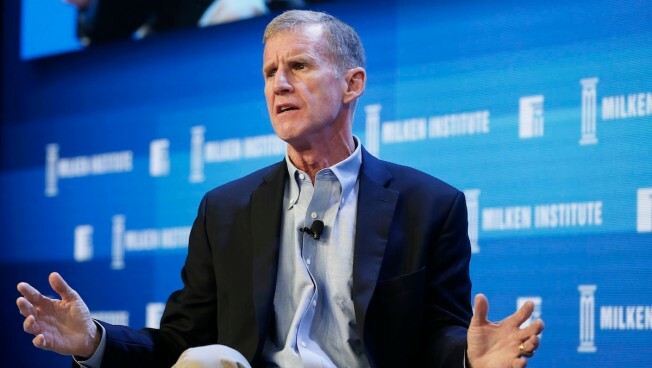 In this file photo, Stanley McChrystal, chairman of Siemens Government Technologies Inc., speaks during the annual Milken Institute Global Conference in Beverly Hills, California, U.S., on Monday, May 2, 2016. Retired Gen. Stanley McChrystal said the U.S. has "basically traded away the biggest leverage point we have." McChrystal's comments were in response to reports that President Donald Trump had ordered the Pentagon to develop plans to withdraw thousands of American troops by next summer. Outgoing Defense Secretary Jim Mattis mentioned the order in his resignation letter. Mattis' last day in the administration is Monday. "If you tell the Taliban that we are absolutely leaving on date certain, cutting down, weakening ourselves, their incentives to try to cut a deal drop dramatically," McChrystal said on ABC's "This Week." McChrystal also said he's worried that the Afghan people will lose confidence in the U.S. as an ally that can be counted on. "I think we probably rocked them," said McChrystal, who commanded U.S. and NATO forces in Afghanistan for about a year. He also was critical of President Donald Trump personally, saying he doesn't believe Trump tells the truth. The comment came when asked what he would say if he were asked to join the Trump administration. When asked if Trump is immoral, McChrystal responded: "I think he is." It's not the first time he's criticized a sitting president. President Barack Obama accepted McChrystal's resignation in June 2010 after he made scathing remarks in a magazine article about administration officials, including about Obama and Vice President Joe Biden.